If you cannot view this email correctly, please click here. 7 years of German Haus at the world’s largest convention for interactive media, music, games, film and much more. Over 70.000 trade show visitors and more than 2.000 bands are set to join numerous start-ups and founders from cities like London, Amsterdam, Montreal, Los Angeles, Beijing, and the rest of the world at this year’s South by Southwest (SXSW 2019) in Austin, Texas. SXSW is the largest and most important information hub and marketplace for the world’s creative industries and digital communities. For the seventh year in a row, the joint German presentation – Germany at SXSW: Wunderbar, German Haus and German Pavilion – will once again feature over 1.000 companies, investors, innovators, artists, and start-up regions like Munich and Hamburg. Delegates are invited to take part in the extensive program from Saturday, March 9th to Thursday, March 14th at the German Haus, as well as at the German Pavilion at the SXSW Trade Show. At its new location at Graeber house on 6th Street in downtown Austin, the German Haus will also showcase many of the 21 German bands and solo artists during its nightly live sessions and will once again be the key platform for showcasing music and innovation from Germany. Funded by the Cultural and Creative Industries Initiative by Germany’s Federal Ministry for Economic Affairs and Energy, Germany at SXSW will again be organized by Initiative Musik and its many partners. At SXSW 2019, German start-ups and professionals from a wide range of established industries are looking for inspiration and potential collaborative partners. At the German Haus, delegates particularly from the digital and creative industries as well as from Germany’s political sphere seek to exchange insights on best practices with international experts, promoting an even stronger global business network. From March 9 to March, 12th, the program will focus on innovation and topics such as the future of mobility, new media and the integration of new technologies with a specific focus on the implementation of artificial intelligence and immersive media. Two program highlights will be the Lufthansa FlyingLab Conference and the opening panel discussion curated by CONVENT, a subsidiary of ZEIT Publishing Group, featuring Dorothee Bär (Minister of State for Digitization at the Federal Chancellery of Germany.) All content formats, matchmaking sessions, and networking events will be open to SXSW badge holders though delegates are kindly asked to register online in advance for the German Haus. 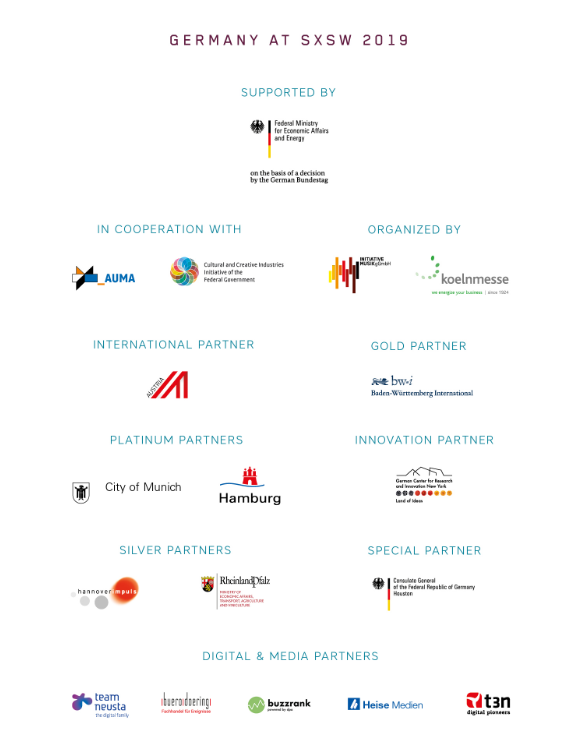 On Tuesday, March 12th and Thursday, March 14th, the German Haus will feature a two-day focus on Creative Technology, additionally funded by the Federal Ministry for Economic Affairs and Energy: “This young and rapidly growing branch of the German Cultural and Creative Industries will gain remarkable momentum over the next few years. It will have a significant impact for our creative communities who are always looking for new ways to express themselves artistically as well as for the established industries who will be able to raise their global market strength and innovative potential,” says Bernd-Wolfgang Weismann, Head of the Cultural and Creative Industries Initiative Division at Germany’s Federal Ministry for Economic Affairs and Energy. Every year, SXSW transforms the beautiful city of Austin into the largest stage in the world – with acts from Germany right in the middle of it all. On Wednesday, March 13, numerous German artists including Gurr, Jazzrausch Bigband, Suzan Köcher, and Wolf & Moon, will perform for an international audience including industry experts, festival organizers, tour agents, music managers and journalists at the Wunderbar: German Music Day as well as the official Wunderbar: German Music Night showcase evening, both curated by Initiative Musik. "We are delighted to be showcasing 21 unique and truly promising acts this year. Delegates are invited to join us on this journey into the thriving and multifaceted German music scene at the Wunderbar: German Music Day,” says Prof. Dieter Gorny, chairman of the Advisory Board of Initiative Musik. While the German artists appearing at SXSW diverge in terms of style and presentation, they all share the goal of leaving a mark on the North American music market, the largest in the world. And what better place to start than SXSW Music Festival with over 160.000 visitors set to join the annual showcase marathon. Lufthansa FlyingLab Conference with numerous international speakers and featuring Moritz Simon Geist with a Sonic Robots showcase. Fireside Chat with Robo-Psychologist Dr. Martina Mara (Ars Electronica FutureLab, Linz) and Holger Volland, Technology Expert, author, and Member of the Board at Frankfurter Buchmesse. German Music Day-Showcases with Gurr, Jazzrausch Bigband, Suzan Köcher and Wolf & Moon @ Seven Grand, Austin. If you no longer wish to receive these emails to (an: unknown@noemail.com) , please click here.